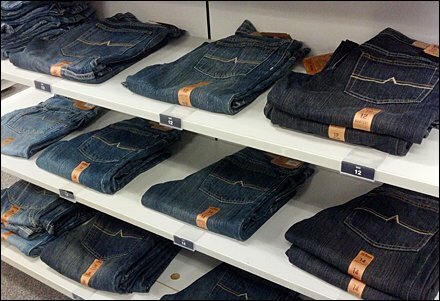 Modern shelf edge label holder systems are a godsend in retail environments with frequent price changes and cost-sensitive clienteles. But that usefulness can be extended into other areas of retail. Here a Label Holder for Sizes Not for Prices sports drop-in, plain-paper labels demarcating size categories. Shopping is easier, the customer happier, and price not the important factor in the sale … yet! My triple comments; the labels are too tall and are becoming dog-eared; the label holders do not include a roof overhang that keeps dust and dirt out; and each holder must be glued to the shelf. Why not use a label holder profile that just grips the shelf edge? 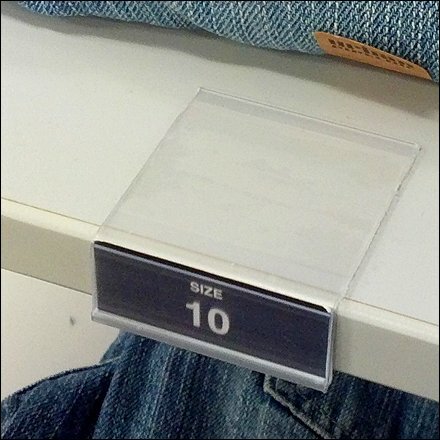 But still, size marked displays are far easier to shop, no matter how the size indicated. PreviousPrevious post:Glass Mugs Hanging on HooksNextNext post:Do You Shop Size or Price First?